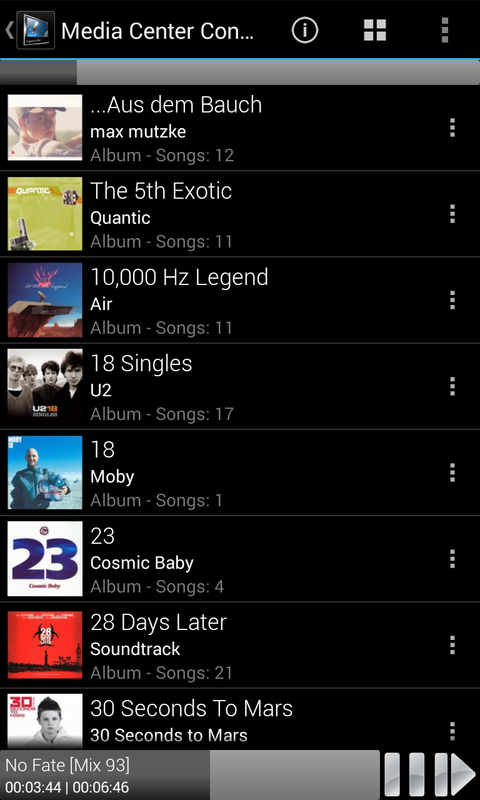 With Media Center Control you can control the Windows Media Center or Windows Media Player with your Android Phone. 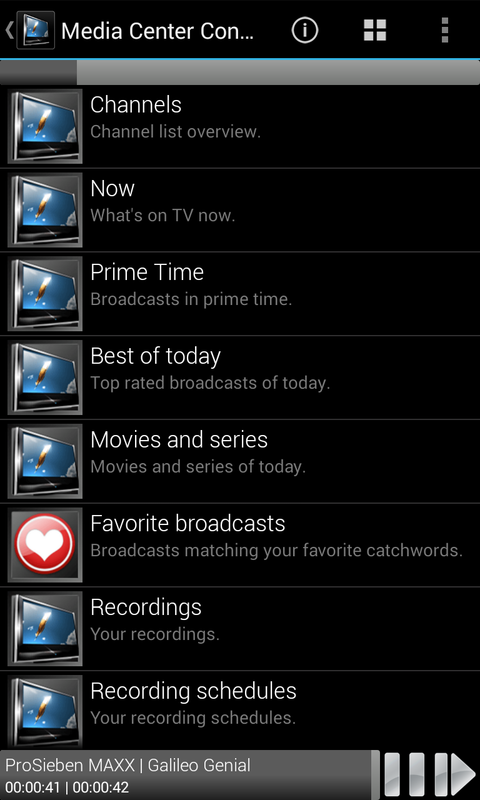 No need to switch on your TV/display to listen to music or schedule TV recordings. In fact, the entire user interface is shifted to the phone to have quick access from a distance. MCC can't be compared with a conventional remote control. Take a look at the video. Because pictures often tell a thousand words. 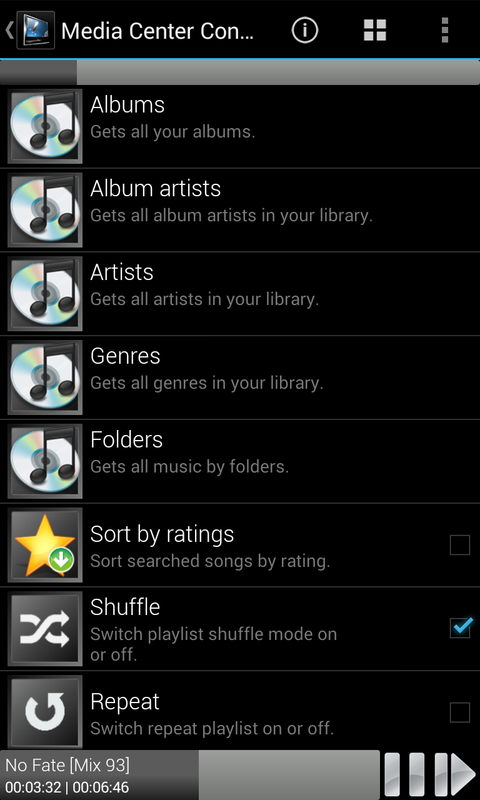 A list of features can be found here. MCC has two components. 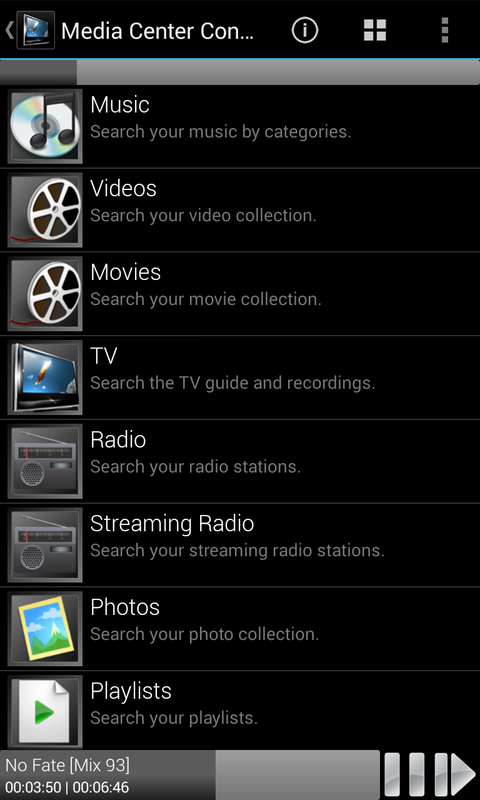 Media Center Control is available on Google Play Store, AndroidPit and Amazon AppStore, where it can be purchased and installed. To make MCC work, you need in addition the MCC server for your Windows PC. You can download it from this site for free. If they want to use the previous version of the MCC, as because the current version in the Amazon AppStore has not yet been released, you can still download it from here. Please visit the MCC forums to get support. Accessible at any time the search button can find your content quickly. 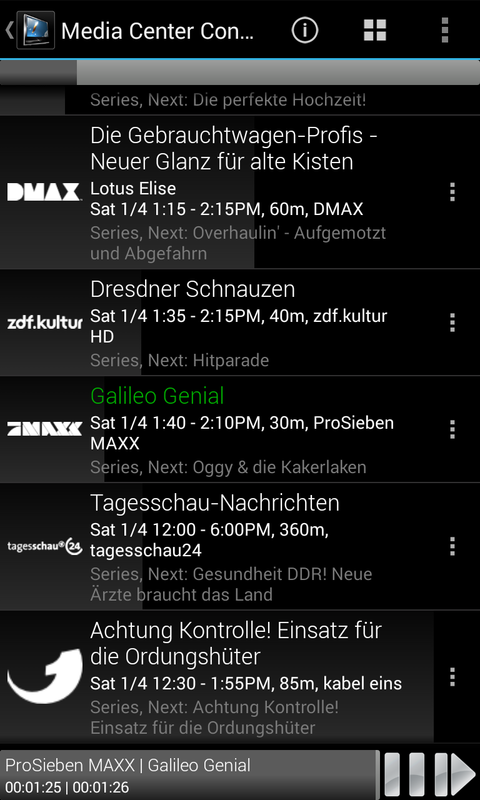 Enter a search term and Media Center Control displays the results directly on your smartphone. Searching for an album title or a television program with a particular actor is easy. 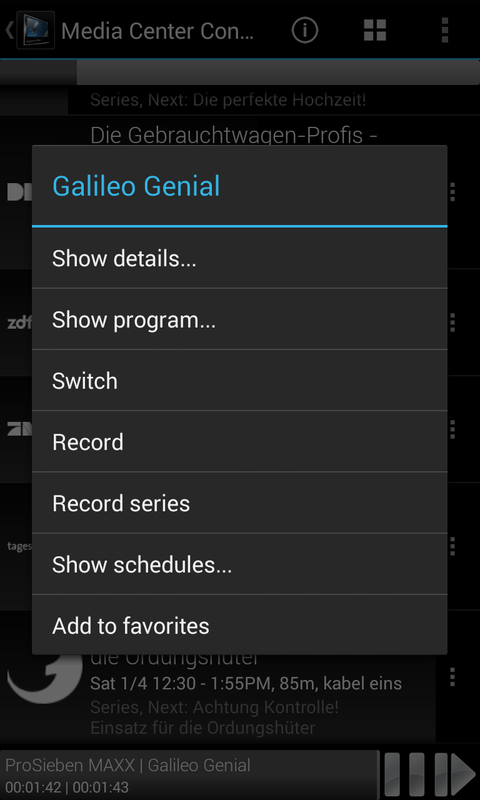 You can control all your media content from your smartphone. This is done automatically via a network connection (eg WLAN/WiFi). The setup is simple and must be performed only once. With an internet connection it is possible to remote control Windows Media Center or Windows Media Player over far distance. If you want even from another country. An internet connection and a router that has the appropriate port open, are a precondition for this. If your computer is switched off and you connect via network, MCC is able to wake your computer with Wake-On-LAN. It works via internet also, if your router is supporting this. - Android 1.6 or newer, touchscreen, WiFi or internet. Media Center Control isn't supporting the Vista Media Center. With Windows Vista you can remote control Windows Media Player only. With Windows 7 or Windows 8 you can remote control Windows Media Player or Windows Media Center. The MCC client must have the following Android rights, which are automatically assigned during installation. Let there be no misunderstanding, here are the required permissions are listed and briefly described. Is required to establish a network connection between your Android sevice and your Windows computer. Is required to save the covers to the sd card. Is required to delay the automatic display suspend (if desired). Is required to validate your Android- application- license.